San Carlos Gulf Shores have much to offer today’s gulf coast condo buyer, with an excellent design, superior Gulf Shores, AL location and attractive rental potential. The development was constructed in 2006 and is equipped with all the modern necessities of home, to include granite countertops, wet bars and jetted master tubs. The incredible gulf views are captured by floor to ceiling glass, that extends from the main living area to the master bedroom. San Carlos is in walking distance to shopping, dining and live music on the beach. Nearby popular venues include the Pink Pony Pub and The Hangout, both of which are staples of the Gulf Shores boardwalk. 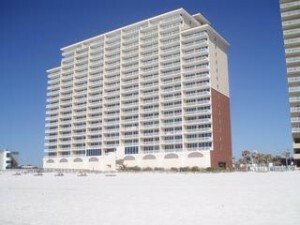 The main attraction is the large expanse of pure white sandy beach and the emerald Gulf of Mexico waters, just a few short steps away from your new luxury vacation condo. Tour San Carlos Gulf Shores AL condos for sale by the Jason Will Real Estate Team 251-866-6464.